This book is filled with creative stories and activities on how to resolve conflicts without harm. Understand how kid bullies become adult bullies! 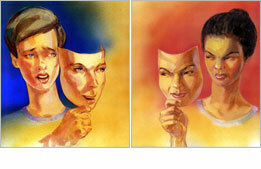 "Extrovert" bullies are outgoing, aggressive, active and expressive. They want to be on top—in control. They are more interested in things outside themselves than in their own thoughts and feelings. Extrovert bullies are rebels and are usually criticized for their rebelliousness. They often end up in trouble as adults. They are sometimes considered "outlaws." Generally rough-and-tough, angry, and mean on the surface, they get their way by brute force. But inside, they may feel inferior, insecure and unsure of themselves. They reject rules and regulations and feel a need to rebel in order to achieve a feeling of superiority and security. "Introvert" bullies don't want to be recognized. They hide as much as possible. They never rebel; they conform to society. But they also want to be in control. They find other ways to get control—sometimes by smooth-talking, saying the "right" thing at the "right" time, sometimes by misleading, lying, saying and doing whatever they think the other person wants to hear, just to get their way. They deceive people into thinking they mean well. They work on becoming "teacher's pet." They are often so good at bullying, that we don't even notice that they are bullying us. Introvert bullies get their power through cunning and deception. They seem to go along with the crowd, but because they desperately want to be successful—get the highest, the best, the most—they will lie, cheat, do anything to get what they want. There are many types of bullies. See if you can recognize any of the following. Can you tell if these are introvert bullies or extrovert bullies? Motto: "I am number One—yeah, ME!" Motto: "I am the elite of society—the upper crust." Motto: Mirror, mirror on the wall, I'm the fairest of them all." Motto: "I'm smart. Therefore, I know better than you!" Motto: "Trash it, jam it, freak out! Do your own thing! Who cares how it affects anyone else?" Motto: "Tune in, turn on, drop out. You're a fool to stay straight!" Motto: "Our country, right or wrong. Love it or leave it." Motto: "There is only one belief worth believing -- mine." Motto: "When I speak, Wall Street listens. So you better listen too." Motto: "You are inferior because you are (fill in religion, race, nationality, color of skin)." Motto: (To Parent) "If you don't buy me this, I'll (fill in your own threat)." Can you think of other types of bullies? This book was based on solving a conflict nonviolently. It helps victims defend from the bully nonviolently, physically and verbally. It helps bullies recognize that they are bullying and to stop. And it teaches you how to recognize your feelings and to help control yourself. It helps you to control the bully or victim inside of you. I liked this book because it taught me that without even trying you can bully. It made me see the bully and victim inside of me, and in a way I’ve been nicer and have not “bullied” people as much as I have been in the past. My mother has also seen a very big difference since I’ve read this book. It has helped me a lot. I don’t think that there was anything I didn’t like about this book. I think it had some very moral values. I would recommend this book to anyone. Now I want to read the others. The book “Why is Everybody Always Picking On Me?” by Dr. Terrence Webster-Doyle is probably the best book I’ve read in a long time. Since I’m going to middle school next year I’ll be in some situations described in the book. The book helped me understand AND feel how the bullies and victims feel. As I read the book I learned things to do when a bully confronts you, walk away, yell or even use humor. These may help you get the bully away or you may even become good friends. When I read the book I began to understand why bullies bully. They are probably bullied at home or beaten so they want to show how tough they are. The victims are usually afraid when a bully attacks they feel scared or worried about what will happen after the bully is through with them. I learned that there are different forms of being bullied like verbal, or physical. I liked reading the stories of Dr. Webster-Doyle and the others that were make-believe. The role-plays really put you in the victim’s and bully’s shoes. I learned that kids aren’t the only ones that are bullies, even adults can be bullies. Politicians and military leaders are jobs that adults have that bully. In conclusion I really learned a lot about bullies and I can’t wait to start reading my next book by Dr. Webster-Doyle. I think I will like each book more than the last. This book tells about bullies and victims and teaches how to be neither one. It explains how bullies may become that way because they are bullied or are hurt inside. It helped me to look at bullies in a different way and made me feel sorry for them. 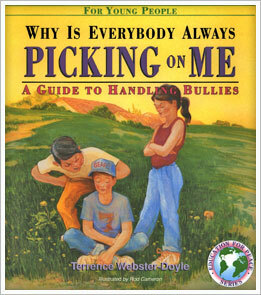 The book also talks about different types of bullies and how some bullying is seen as “successful." Victims are sometimes attacked by bullies because they act like “poor me” and the bullies see that as a sign of weakness. The book tells how not to act like a victim and to not BE a victim. I really liked the role-playing and questions that helped me to think of ways to avoid a fight. I also liked the stories. My favorite one was called “The Difference Between Heaven and Hell.” This book was very informative and fun to read. I learned a lot of things that will help me to become the best person I can be. Thank you Dr. T! This book is a true book. This book is good for kids and adults. The book is about bullies. There are many types of bullies, This book tells why bullies are what they are. Bullies are usually brought up in a home with guns and drugs in it. Bullies are insecure people. This book was written by the man who actually experienced what bullies have to offer. He wants you to know how to get out of a bully fight. Some bullies were bullied when they were young so they think bullying is okay to do. Did you know if you were a bully while you were a kid you will probably be an adult bully. This book can help you handle the stress of a bully. Bullies don’t hurt you they hurt themselves by using the wrong things from their mind. Bullies are aggressive, tough too. Bullies are violent to other people. I think bullying should stop in this world. Bullies either get bullied at home or learn it. Bullies’ minds get filled with bad thoughts so they do what is in their mind. Bullies think they are stronger than you are by fighting. They fight because they want to be strong. I think bullies should have confidence in themselves. You can trust bullies to fight. You can’t trust them not to fight. Bullies start conflict by saying words that could hurt you. You could stop conflict by being kind and helpful. Bullies don’t just fight they can kill too. Bullies can say something that isn’t true. Bullies fight because they want to feel that they are the best. But when they think about what they did deep down they feel hurt. So they go find the kid they bullied and say sorry. Some bullies feel it but don’t say sorry. I think bullying should stop right now too.